Huawei’s AR100/AR120/AR160/AR200 fixed interface access routers provide routing and switching functionality for branch offices and small businesses. They feature easy installation and configuration, quiet, fanless operation suitable for office environments. 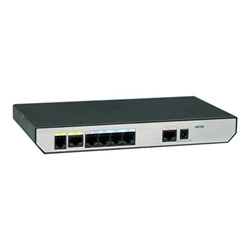 The routers are available with four or eight Fast Ethernet (FE) ports and two uplink ports for load balancing and link protection. They have a total capacity of 100 Mbit/s to 150 Mbit/s, voice and data support, and wireless access. Huawei’s AR series routers provide built-in firewall, a broad range of VPN options, and comprehensive authentication and defense mechanisms.